If the PAS leadership feels that is Haram working for Keadillan in Permatang Pauh it is time the Pakatan sack PAS. This is the most opportune time to do that. As Mahathir trains his guns on Najib and the fall of Najib is imminent. UMNO is too preoccupied with a segment of the membership trying to apple polish the boss and another aligning itself to help Najib whilst the majority as usual are wondering what is going on and are waiting for the right wind to blow to see in which direction they will sway simply referred to colloquially as lallang. With the launch of his road show Mahathir is going on a non holds barred campaign to take Najib out. According to reliable UMNO sources some very senior MPs and ministers have given Mahathir their support should it come to the crunch. 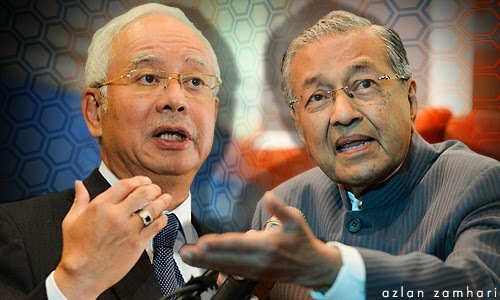 Mahathir's job is to expose Najib abd that he will be doing very soon, for the moment it is all hints, remember Sirul was Mahathir's body guard before becoming Najib's, but what worries Mahathir is that Najib may have a lot of cash in his treasure chest to pay off anyone who could implicate Najib. Mahathir sent out his first salvo by doing the maths on the 1MDB which has created a huge dent on Najib's credibility especially with the Johor and Selangor youth with some preferring to take a wait and and see attitude while a seizable number actually wanting Najib replaced this can happen once Mukhriz makes a standto support his father. With Mukhriz remaining silent others dare not openly commit to Mahathir's plans. Certain branches in Penang are already pro Mahathir together with the majority in Kedah. In Johor almost all youth heads are aligned to Muhyidin and are hoping he will make a move for Najib's position as he has a very legitimate reason to do so and Muhyiddin it seems is moving in that direction whilst Najib is aware of it, rumor has it Muhyiddin may be dropped from the DPM position in favour of Zahid after the two upcoming by elections. Hishamuddin is expected to go back to home affairs with Zahid as DPM and Muhyiddin is to be placed in the PM's department with some sources saying he may be given nothing. Sarawak reports latest makes the timing even better we can expect more accusations hurled at Najib via Mahathir tat will keep UMNO busy. 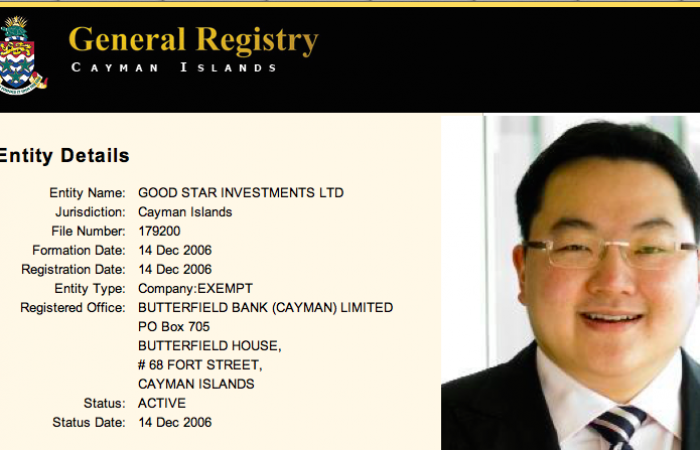 The latest revelations by Sarawak Report has only added fuel to fire, and Tony Pua's experience with Najib seems to suggest that he - Najib was not too truthful in his replies in Parliament when questioned about the repatriation of the money from Cayman Islands. Tony Puah claims that Najib had said that the money was put in a Singapore branch of a Swiss bank the SI bank, but it is alleged the Bank had informed the Singapore authorities that this was not true and no money has been placed in that bank. With the latest reports coming out of Sarawak Report SR) alleging that US$330 million meant for partner PetroSaudi International has actually been deposited to businessman Low Taek Jho gives Mahathir more reason to go after Najib and to get him out of office. US330 million is equivalent to more than RM1 billion and now Mahathir will be demanding to know why such a huge sum of money was given to Jho Low's Company and for what, and especiaally why this transaction was hidden from Bank Negara. It is alleged by SR that 1MDB made an application to Bank Negara for the amount to be transferred to PetroSaudi, but SR has in it's possession records showing the amount was allegedly banked in to Good Star Limited instead, a company purportedly controlled by Low. The situation in UMNO is so unstable now with what looks like a scramble for power. The vice President s smell blood and there is scramble for the top posts. Notice that at Permatang Pauh it is not Muhyiddin who is leading the campaign but Zahid. Muhyiddn is not to be seen and is more visible with Mahathir. This is the best time for the Pakatan leadership less Hadi to go for PAS, if PAS decides to go it alone they'll either have to stand in place of UMNO in the various consistencies in the country as they can't stand on a BN ticket. MCA, Gerakan, MIC and the others will not have them in and the BN there must be consensus of the entire membership to add another to the coalition and Njib may not get it. If he tries he will only make matters worse for himself. Najib may give PAS a free ride without UMNO contesting in the constituencies that are theirs, but if UMNO decides to contest together with PAS the bet will be on the PKR candidate winning, and if either one stands alone the bet is still with Pakatan. Najib can't afford to let PAS stand alone without and UMNO contestant he will not have enough seats to satisfy the UMNO aspirants and that can turn into another problem within UMNO. Remember PAS never did so well till they joined Pakatan they will return to their original status should they be sacked and chances are they'll do even worse as the moderates are now pulling out their support so what betrter time than now to sack PAS. With the sacking of PAS, Pasma will most certainly move in to fill the vacancy in Pakatan. PKR will then be ready to take on BN for the next GE on. The time is ripe, the UMNO scandals have peaked from the BMF scandal up to this day the pile is so high even Mahathir is fearful of an opposition victory, the internal bickering in UMNO has reached fever pitch, PAS out in the cold will have to leech on UMNO and destruction of both may be complete, in fact at the next GE it will be a landslide going by these indications. This is the time Pakatan has to be decisive and bold sack PAS, it will show all Malaysians that Pakatan has character and that is what is lacking in BN today it has no character. If Najib on the other hand is removed, PAS will certainly lose its chances of any alliance with BN and that will be game over for PAS, with Najib as PAS doomed to history.